Original 27" X 41" One Sheet poster from the 1954 Alfred Hitchcock classic "Rear Window" starring James Stewart, Grace Kelly, Thelma Ritter and Raymond Burr. Condition: Good to Very Good. The poster has small paper loss at the bottom two crossfolds and tiny paper loss at the top crossfold. It has pretty minor wear on the folds and pinholes and creases around the edges. The poster was very lightly partially folded in half an extra time. It had tiny surface paper loss in the upper left of the window at bottom left, with tiny surface paper loss in the red background below the "AR" of "REAR" in the title. Someone used crayons to color in the surface paper loss, to make it less noticeable. It has a piece of clear tape on the back of the top corners, but they were not put there for a restoration purpose. Other than the above, the poster has not had any attempt at restoration. After a pretty simple linenbacking, this poster will look incredible, especially because the reds in the poster have not faded in the slightest. Feel free to ask any questions. 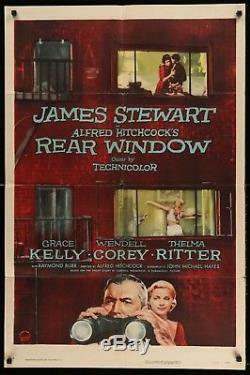 The item "Rear Window 1954 Original One Sheet Alfred Hitchcock" is in sale since Tuesday, April 3, 2018. This item is in the category "Entertainment Memorabilia\Movie Memorabilia\Posters\Originals-United States\1950-59". The seller is "offthebeatonpath" and is located in Brentwood, Tennessee. This item can be shipped to United States.